Would you attend a Hello Kitty convention? Marty Garrett and Salumeh Eslamieh gave up their garage for Hello Kitty. The married couple turned the garage of their San Francisco home into a showroom for their vast Hello Kitty collection. Museum-style glass cases hold hundreds of rare and vintage Kitty items, including a rotary phone from 1976 and a gumball machine from 1983. 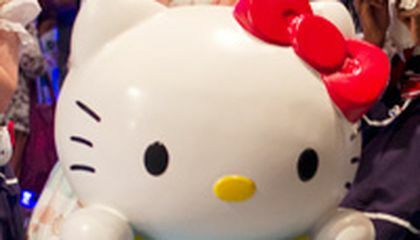 A four-foot-tall fiberglass statue of the Sanrio character, which Garrett calls "the holy grail of our Hello Kitty collection," stands in the corner. The couple met and bonded over the little white cat (or the little girl with kitty ears and whiskers, if you prefer), and will travel to Los Angeles this week to celebrate the character's 40th birthday at Hello Kitty Con, a four-day festival dedicated to all things Kitty. "This is the first time there has ever been a fan convention of this kind," Sanrio spokesman Dave Marchi said. "It's the only one happening anywhere in the world." And it's already sold out. More than 25,000 fans are expected. An exhibition at the neighboring Japanese American National Museum, "Hello! Exploring the Supercute World of Hello Kitty," will continue through April 26. Garrett and Eslamieh, both 32, were already Hello Kitty fans before they met, and their union has only fueled their fandom. Though most of their Sanrio collection lives in the garage-turned-showroom, there are pieces sprinkled throughout their house. The couple keeps a mini Hello Kitty kitchen inside their real kitchen, and they hand-painted a skylight above their dinner table with Sanrio characters. "It's a pretty substantial part of our interests together," said Garrett. "It does sort of guide and direct the things we do." During their courtship, Garrett worked at a Sanrio store where Eslamieh would often visit. When the store closed, they bought its giant Sanrio sign, now on display in their showroom. They visit Sanrio stores where ever they find them. They made a special trip to Japan to visit PuroLand, Tokyo's Sanrio theme park, and went to Honolulu's Sanrio Cafe on their honeymoon. "I always wanted more Sanrio," said Eslamieh, who has a Hello Kitty tattoo on her shoulder. The college professor confessed that her mother once called a radio psychiatrist for advice about her daughter's lifelong obsession with Kitty/kiddie characters. "You have to like cute things, and that's just not some people's personality," said Eslamieh, who keeps her love of Kitty separate from her professional life. Garrett, an elementary school teacher, has always been a collector. He collects video games, too, and has 676 of the 677 original Nintendo games. Garrett has integrated his love of Sanrio stuff into his work. Some of the couple's collection is kept in his fourth-grade classroom at Lawton Alternative School. Seasonal Sanrio banners hang outside the door, a giant acrylic Hello Kitty face greets students inside, and a pile of plush toys sit atop the bookcase. "And especially that he's a man," Eslamieh added, "it gives boys license not to have to be so macho." Critical thinking challenge: Why did the Sanrio store where Marty worked sell its sign? I would not go to a Hello Kitty convention just because I like that. I think that all of this people should get a different hobbies or something, because Hello Kitty will be forgotten and then what well they do. I think it's a little weird that they have that much stuff and that old to?? I would sell the stuff personalty its probably worth a lot but if that is what makes them happy let it be. I would never attend a hello kitty convention. It sounds boring. 25,000 fans were expected. I wonder how many really came to it? you have to like things that are cute. I Would Attend this Hello Kitty convention because I like hello kitty. I think that this cartoon is adorable, or cute. the reason why I think that is because people of all ages enjoy this certain character. Hello kitty has certainly made me re-think my entire life. Why, you may ask, Hello Kitty isn't even a cat, but a little girl named Kitty. Which is why I'm re-thinking my life. I personally would never go to a Hello Kitty Convention because that's me, but apparently many people adore and love her. Its interesting and many people would enjoy this convention. I would definetly go to a hello kitty convention because i love hello kitty . and it would be super fun to be involved in .